I suspect most local cyclists have read the most recent road wars article in the Sentinel. As is typical, the comments are full of hate and threats of violence from the typical lowlifes who frequent newspaper comment sections. I don’t recommend you read them. I do, however, fear that some lowlifes are emboldened by what appears to be solidarity and support for their hate. The last time our local media fanned the flames of road rage, I felt the effects immediately the following weekend. Friends reported a notable increase in hostility on their rides as well. This is clearly a hate group and it’s managed to attract 32,000 fans from the shallow end of the gene pool. 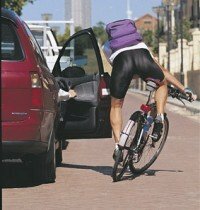 The content purposely incites hatred and violence against cyclists. As someone who has ridden in an area with predatory sociopaths who think it’s OK to assault cyclists, I don’t believe this can be written off as harmless venting any more than if it was directed at ethnic minorities or gays. The last thing these scumbags need is a sense of solidarity to egg them on and make them feel righteous in control of a 4000lb missile (which happens to offer anonymity and easy escape). What do I do if I find an explicit, hateful or otherwise objectionable group on Facebook? What do I do if someone has posted an objectionable photo on Facebook? This group and many associated photos have been reported repeatedly over the last 2 months. Yet Facebook has failed to respond or uphold its policy of removing hate groups. Therefore, a group has been formed for cyclists to unite in demanding that Facebook uphold it’s policy and remove both the group and its creator. If you are a Facebook member, I urge you to join HELP REMOVE this HATE GROUP against cyclists!.